Carry on goal to protect minorities’ freedom, punish perpetrators – US commission to Sri Lanka gov’t. A US delegation, which visited Sri Lanka to assess the climate for religious freedom, other human rights, and tolerance, have noted progress on the issues in Sri Lanka since the country’s 2015 election. It cited the importance of punishing perpetrators of attacks and stopping harassment of religious groups trying to build houses of worship. Commissioner Eric P. Schwartz of the United States Commission on International Religious Freedom (USCIRF) said he met with Minister of Foreign Affairs Mangala Samaraweera, Justice Minister Wijedasa Rajapaksa, Minister of Buddha Sasana Karu Jayasuriya, and Minister of Muslim Religious Affairs Abdel Halim Mohamed Hasheem, as well as representatives from Sri Lanka’s diverse religious communities during the March 15-17 visit. “We are encouraged by statements made by officials with whom we met,” Schwartz said in a statement posted on the commission’s website. He cited among “welcome” developments comments he heard supporting national reconciliation among all Sri Lanka’s religious and ethnic communities. “After a devastating war and reports that religious minority communities were increasingly subjected to attacks in recent years, the new government’s engagement with religious minorities is an important step forward in the effort to promote national unity and increased space for all religious groups,” the commissioner pointed out. Buddhism is the official religion in the country where Buddhists reportedly comprise more than 69 percent of the 21.87 million people. Most of the rest are Muslims (7.6 percent) or Hindu (7.1 percent). Christians make up about 6.2 percent of the population. Expressing pleasure in hearing that reports of abuses against minority religious communities have diminished over the last few months, Schwartz encouraged the government to hold perpetrators of such crimes accountable. “We believe accountability will encourage a critical sense of security and well-being among affected communities,” he stressed. He also said representatives of civil society at meetings reported “continued concerns about the ability of religious communities to practice their chosen faiths without restriction,” citing experiences of intimidation or harassment when trying to build houses of worship. “We hope and trust Sri Lankan officials will address these issues in the weeks and months to come,” Schwartz said. The U.S. Congress created USCIRF in the International Religious Freedom Act of 1998 (IRFA) as an independent, bipartisan, federal government entity to monitor the status of freedom of religion or belief abroad and provide policy recommendations to the President, the Secretary of State, and Congress. Maithripala Sirisena won as president in the Jan. 8 polls set by incumbent President Mahinda Rajapaksa in the latter’s bid to seek a third term. 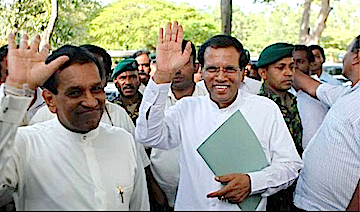 Sirisena has pledged to abolish the executive presidency within 100 days of being elected, and repeal the controversial eighteenth amendment and restore the 17th amendment that limits the president’s rule to two terms and sets other restraints on the presidency. Bishop Rayappu Joseph of Mannar on Tuesday (Feb 24) joined a demonstration led by the Tamil National Alliance (TNA) against the Geneva-based United Nations Human Rights Council (UNHRC) decision to delay the release of a report on issues of accountability during the Tamil separatist war and the post-conflict period. However, Bishop Thomas Savundranayagam of Jaffna where the protests were held refrained from joining the protest due to the participation of politicians in the event, Sri Lankan online newspaper, The Island, reported on Thursday. TNA (Tamil: தமிழ்த் தேசியக் கூட்டமைப்பு) is a political alliance in Sri Lanka composed of moderate Tamil parties as well as number of former rebel groups that has participated in elections since 2001. Bishop Joseph meanwhile reportedly called the deferment of the report’s release as UNHRC’s deception of the Tamil people who have no faith in a domestic investigation of war crimes under any government. On the day of the protest, the Tamil Civil Society Forum (TCSF) and the Welfare Organisation for the Forcibly Disappeared Persons also jointly decided in Jaffna not to appear and give evidence before the Presidential Commission to Investigate Complaints Regarding Missing Persons (PCICMP). In their statement released Feb. 27 the forum convened by Bishop Joseph listed reasons why it is convinced that a credible inquiry is possible only through international means. “We cannot afford to continue to appear before this commission giving it a stamp of legitimacy,” Task Force leaders wrote. The UNHCR investigated allegations of war crimes following a resolution adopted last March, and planned to present its report during next month’s session. However the UN body announced it would issue its report in September instead after newly installed Sri Lankan President Maithripala Sirisena assured that government would conduct an impartial and transparent domestic probe into allegations of atrocities. Sri Lanka’s Foreign Minister had reportedly asked the UN body to give the administration installed in January more time to establish a new judicial mechanism to deal with the fallout of the investigation. Alleged war crimes include attacks on civilians and civilian buildings, and executions of combatants and prisoners by both the Sri Lankan military and Tamil Tigers – the guerrilla organization established in 1976 that sought to establish an independent Tamil state of Eelam in northern and eastern Sri Lanka. Sri Lankan military and paramilitary groups backed by them were also accused in enforced disappearances and acute shortages of food, medicine, and clean water for civilians trapped in the war zone. Tamil Tigers were allegedly recruiting children as fighters. The group gained control of Jaffna Peninsula by 1985, two years after escalation of violence between the Tamil Tigers and the Sri Lanka military. It lost control of Jaffna in October 1987 to an Indian peacekeeping force that had been sent to Sri Lanka to assist in the implementation of a complete ceasefire. However, following the withdrawal of the IPKF in March 1990, the Tigers grew in strength and conducted several successful guerrilla operations and attacks around the country and in India. Earlier in 1981, Pope John Paul II created Mannar diocese from territories formerly under the pastoral care of the Jaffna diocese. With political alacrity, Sri Lankans have voted in a new president thwarting an incumbent’s plan for an unprecedented third term seen as a move to further entrench dynastic power. The cosmic speed of behind-the-scene events before and after the Jan. 8 election took many by surprise. Was President Mahinda Rajapaksa’s decision to quit midway through vote-counting a final act of magnanimity or a crafty move to ensure his political future? Where does it leave the kitchen cabinet of siblings and son, who continue to hold office? Before returning to his native village, Rajapaksa had a final tete-a-tete with soon-to-be prime minster Ranil Wickremesinghe, a longtime friend, though vintage political antagonist. What transpired remains unknown. Only history or future political memoirs will divulge the mystery of the Rajapaksa exit. Some insights may be discerned from newly elected President Maithripala Sirisena’s speedy decision to be sworn-in within hours of his victory. The ceremony was simple but rich in symbolism. In order to counter witness to the lavish presidential lifestyle of the past, the Gandhian new president had instructed his staff to restrict his inauguration expenses to fifty dollars. He took the oath of office in the presence of a Tamil judge of the Supreme Court, not in the presence of the country’s chief justice, Mohan Pieris, the Catholic appointee promoted by Rajapaksa after impeaching Chief Justice Shirani Bandaranaike. Reportedly, the installation was unduly speeded up partly to relieve the public regarding fears of an alleged military intervention. Two days before the Jan. 8 election, a Muslim citizen wrote a 13-point open letter to the army commander deploring politicization of the military. All armed forces are under the defense secretary, Rajapaksa sibling Gotabhaya. Social media too reported that even before President Sirisena swore him in as prime minister, Ranil Wickremesinghe had private discussions with military leaders to assuage army fears of counter politicization, as well as to allay public fears. Social peace and stability will be essential if the new president is to implement his 100-day program of constitutional reform and return to a just and equitable system of governance. He heads a rather loose coalition of disparate political elements, some of whose retinue may be nursing hopes of political perks and rewards. But the new president’s greatest asset is public confidence and hope for a return to an era of peace and social justice based on the equality of all citizens irrespective of race, religion or political persuasion. He received the unprecedented support of all ethnic groups. His highest percentage of votes came from the Tamil-speaking northern and eastern regions. After a decade of discrimination, partisan politics, nepotism and corruption, the ethnically and economically fractured nation of 21 million will have thousands of grievances. The religious sector has the unenviable role of soothing their anxieties and championing their just causes. Religious leaders must heed the chiding by the nation and recommit themselves to guiding rulers with diligence and not pandering to their weaknesses. Much fallout of this period of transition could be contained if Church leaders act as Romeros, not as Richelieus. In a statement to Fides news agency, Bishop Vianney Fernando of Kandy, has already welcomed the election of Sirisena. The country’s senior bishop expressed hope that the new president would implement the program of anti-corruption, good governance, commitment to development and reconciliation he placed before the country’s bishops. 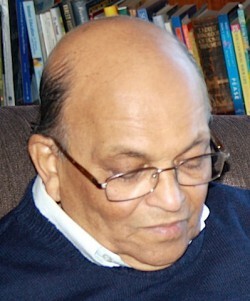 Veteran Asian Church journalist Hector Welgampola from Sri Lanka has retired as Executive Editor of the former Union of Catholic Asian News (UCAN) based in Hong Kong, then Bangkok. Before UCAN, Hector headed editorial teams of newspapers in Sri Lanka. Since retiring Hector has lived in Australia with his wife, Rita. He authored the resource book Asian Church Glossary and Stylebook. Tamil Civil Society Forum (TCSF) has called upon Pope Francis to visit war-torn areas in the North and East and visit the survivors of the “war against Tamils”, as part of his visit to Sri Lanka in 2015. TCSF – a network of Tamil civil society social activists from the North and East including Bishop Rayappu Joseph of Mannar, aired their appeal in a letter to the Pope on Sunday. It requested him to openly call upon the Government of Sri Lanka to genuinely address grievances of Tamils during his meeting with President Mahinda Rajapaksa. In her presentation to last month’s International Conference on Politics and International Affairs in Athens, Salma Yusuf, pointed out that while the defeat of the militant Liberation Tigers of Tamil Ealam (LTTE) in May 2009 ended the three decades-long conflict, its root causes remain. Yusuf, university lecturer and adviser to programs on human rights law, transitional justice, comparative social justice and peace-guilding, stressed that grievances of all factions in the conflict have to be addressed. “When advocating reconciliation and unity, the fears and anxieties of all communities must be acknowledged, understood and addressed,” Yusuf said. Ruki Fernando Out of Detention, Is He Free? What Can Asia Expect from Upcoming Papal Visits?